We decided to try some foil board training getting towed behind a boat to get used to the foil board without having to worry about a kite. I was interested to see if this would accelerate learning. The water is flat and there is no kite to control so the focus is on the foil board. The drill was to keep weight on the front foot and weight forward and get the board planing on the water. The theory seems simple, putting it into action is much harder . . . Here is a video of the action. This was the first time on a foil board for Stuart, James, Cameron and Grant. I wasn't able to participate due to my hamstring injury. There was general agreement that it is hard to do! Watching the video, its apparent that getting forward on the foil board is difficult when getting towed. Session 433. Foil 03. Headed to St Kilda for another foil board session. It was blowing around 20 knots most of the day so I chose my 8m kite. I wore my 1mm wetsuit over my 2mm shorty for better leg protection. I called in at The Zu Boardsports on my way to the water. With those in mind I navigated the learner kites along the shoreline and body dragged out to deeper water. Success! I was able to got up and going on a left tack - it was an amazing experience. Once you are on the foil its like flying and completely smooth. Its easy to go fast. 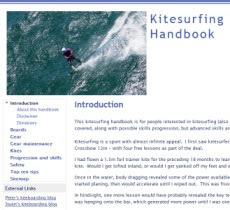 There is no pull on the harness and the dynamic between kite, board and water is completely different. I stacked, bailing off the board, then had a another go. Heading back on the right tack was actually better - I was better able to control the board speed and keep the board close to the water. Feeling confident, I did the walk of shame back for another run. I got up on the foil again and was going fast, then had another big stack, catapulting off the board and looping the kite. During the yank I felt a popping that seemed to be in my left hip and then there was pain. I realised it was the hamstring and I had probably torn it so it was session over. 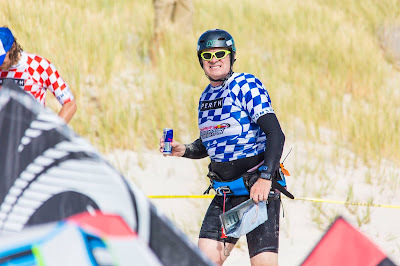 I am wondering why I didn't back the power off when I got going fast, its a similar problem I had when I was first learning to kitesurf and would get overpowered and crash. Its easy to underestimate the additional power on tap by having negligible resistance from the board. I was able to gingerly pack up and walk back to my car. Ivan's advice back at the shop was to NOT bail right of the board when crashing and to try to stay with it. My left hamstring had been tight for a couple of weeks, I first noticed it in Perth. In hindsight I may have had a Grade 1 hamstring injury, although I am not sure how. Today, I appear to have Grade 2 hamstring injury. Its sore to move the leg in some directions and there is a painful region under my left buttock. This could take a couple of weeks to heal . . . which is very disappointing. Session 432. There was some good wind after a recent poor patch, frontal rather than a sea breeze. Great to get some good speed and high jumps. Surfing the swell was good too. I haven't been doing any tricks for a while (back roll, kiteloop etc) but have been thinking about incorporating a jump and loop in transition on the surfboard. I did a longer run out then back up to the marina, then back out and slalom turns back to the beach. The wind dropped off a bit for the last bit of the session. Chatted to Paul and Anthony on the beach about foiling. Paul is up and going and loving it. Anthony is learning. The water at Hampton was quite clean compared with St Kilda where e-Coli levels are still high. Session 431. Foil 02. Following Ivan's advice I went to St Kilda to learn on my foil board. There is flat water behind the breakwater and around 15 knots is ideal. Foiling is HARD to learn - I think its harder than learning to kitesurf. Its about 90% board and 10% kite. I got out of the water and on the board several times but it felt really weird. Its like having a sea anchor underneath your board. It seems you have to forget everything you have learned to date (edging the board, pressure on rear foot etc) and focus on keeping the board flat and weight well forward on the front foot. I had fitted the rear footstrap which helps with controlling the board. I tumbled off it toeside a coup of times, clunking my shins on the edge of the board (and drawing some blood). I continue along, wary of other kiters. Struggling. My brief attempt on the return tack was even less successful. I walked back along the beach. Keeping the board flat on the water makes it easier to handle. When body dragging (out) have the kite on one side and the board on the other (so you don't get yanked onto it). If you are crashing bail off the board to get clear of it. Keep at it! This summer I am going to get up and going. I have been told it takes around 10 goes like this for it to "click". This was the first time I had actually got up onto the board (but not the foil) for a short period and controlled it. Session 430. Racing at last! I was lucky to get a good start on the upwind side of the course. I was very wary as the huge throng of kiters dashed off. I got upwind and stayed there, keeping out of trouble. It was quite a spectacle watching the bulk of kites progressing downwind, with those on foil boards soon getting a significant lead. I was feeling tired after the "one hour warm up" so I was concentrating on keeping the kite flying well and resting my rear leg occasionally. It was nice to relax a bit and enjoy the mission. My Flite 14.5 was providing good power. Several kiters on twin tips were keeping pace with me, and one passed when I stacked briefly into a wave (one of two stacks). The water wasn't rough but there were odd waves and peaks so concentration was required. Heading just left of the cranes on Fremantle Docks two large moored ships eventually came into view. I steered well downwind to avoid the wind shadow behind one, the other was downwind. Even so, I got a brief lull as I passed the stern of the ship. 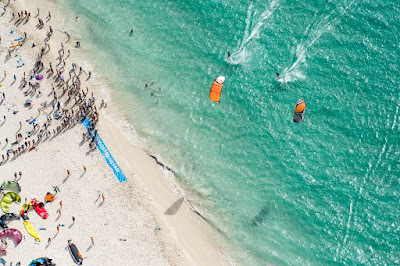 A couple of racers that went close would have been scared their kites would fall out of the sky. Then I picked the final target just left of the Fremantle Life Saving Club. 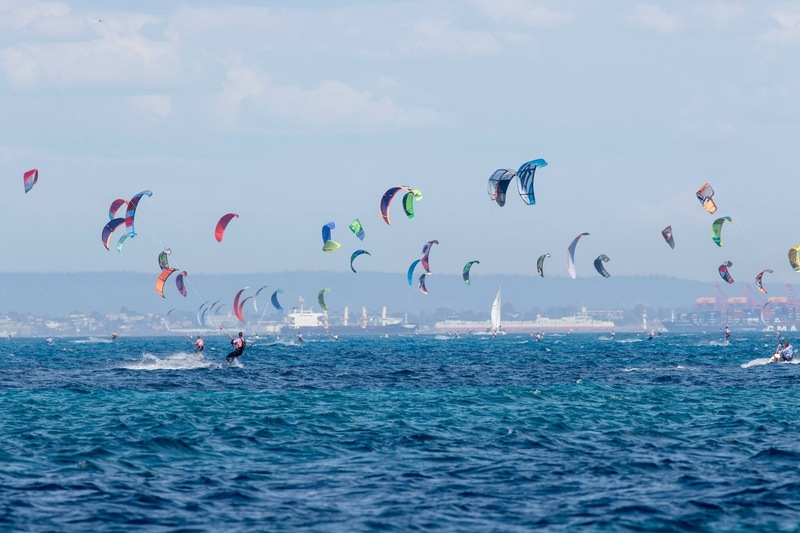 Kiters were converging on the fairly narrow gate between a moored boat and a buoy. There was almost a traffic jam getting through the gate with a couple of kites just behind me. I DID IT! Stoked to finish. I came into the beach a bit overcooked in a bit of a daze and boosted off my board to land on the sand. Then it was kite down and time for a drink. A couple of cans of Red Bull (event sponsor) went down well to replenish my well depleted energy levels. I finished 43rd overall and 26th in the Male Foil/Race/Surfboard category with a time of 35:59. Olly Bridge, the winner, did it in 19:34 on a foil! Here are the provisional results. Several twin tip riders finished ahead of me including Jordan Girdis (1) Aaron Hadlow (2) and Rou Chater. I caught up with Nat, she had a good run and was hoping she got second in the female foil/surfboard class, which was later confirmed. Well done Natalie. The start, just pass the boat. Was it worth it? Yes, this race is definitely worth doing. You may not be aiming for a very fast time but its a great accomplishment and has a really good vibe. Some training around Leighton Beach is good to get familiar with landmarks and the wind direction. Its a crosswinder rather than a downwinder so train for that. Have a big kite in your quiver in case the wind is light, my 14.5 was great. Use a board that is good in light wind. Allow a few days to partake in some excellent kitesurfing along Perth's beaches. I would like to thank Tim Turner (the Race Director) for his invitation and support for this great event.